Glasurit paints employ state-of-the-art European technology that gives the ultimate blend of speed, ease of use, color match and durability. 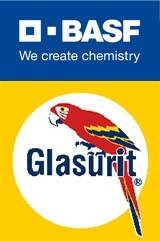 The rich liquid color and deep brilliant gloss defines Glasurit as a world-class finish. Only Glasurit delivers a comprehensive system of perfectly matched products and processes from primer to clearcoat. Long considered a worldwide standard of excellence, Glasurit continues to deliver the productivity and quality that discriminating collision repair businesses demand. CLICK HERE > > to visit website.